Solid Ground collaborated with a local Chester church, Vineyard 53, for the second year running to orchestrate a family-friendly Christmas event; Carols at Carriage Shed. Taking place one cold December, Sunday evening the affair was a free event suitable for all ages, families, and four-legged friends. The two-hour programme was a jam-packed celebration of festive activities taking place amongst twinkly lights and enchanting Christmas decorations. People began to arrive from 5pm, with kids settling down at the crafts table, and a large refreshments tent dishing out free teas, coffees, yule logs, mince pies, and a special DIY hot chocolate station. Within the first hour of being open, the space had filled with people and there was a big crowd by the time the main carol singing and Nativity kicked off. A large screen displayed carol lyrics so people could sing along, as well as short, comical video clips which aided the actors’ performance of the Nativity. During the event, we posted live Facebook videos and Instagram stories to showcase the event and got stuck in to singing along with the other carollers. 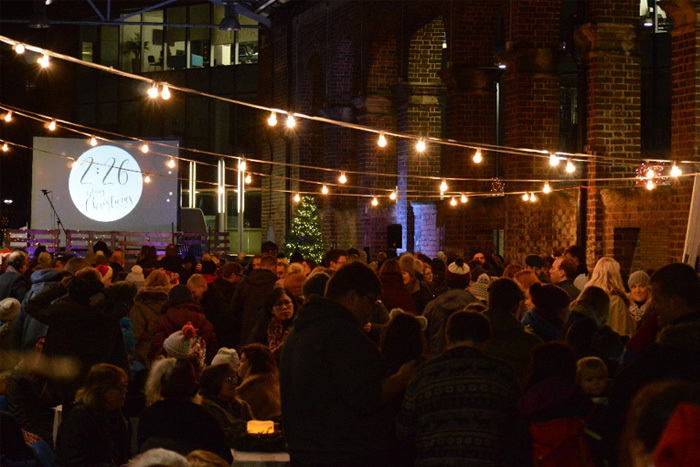 Carols at Carriage Shed was a roaring success, thoroughly enjoyed by all who attended, and proved a memorable experience for the Chester community in the countdown to Christmas 2018.